It's been one of the stranger finals that we can remember, but in the end there had to be a winner, and that winner was Chance Kornuth. 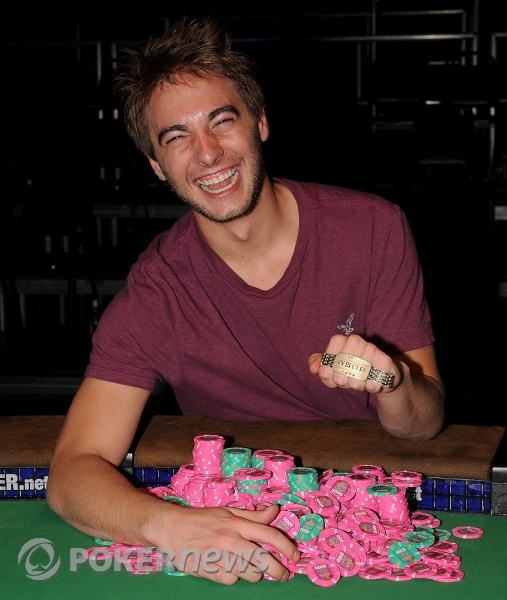 Kornuth turned 24 just six days ago, and what better way to celebrate than with a bracelet win. 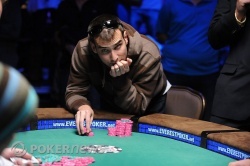 This is only Kornuth's second WSOP cash, and he had to fight for it all the way. The final table he was up against had some very serious pedigree - Jose Nacho Barbero, Eric Liu, Robert Mizrachi and Julian Gardner were among those he defeated to take the win. The Amazon Room has finally fallen silent, but we suspect that a pack of extremely happy young folks will shortly be hitting the bars and clubs of Vegas. Chance would be a fine thing, wouldn't it? From everyone here at the Rio, it's over and out. Chance Kornuth opened for 200,000 from the button and Kevin Boudreau made it 600,000 from the big blind. Kornuth flat-called. They saw a flop. "OK, let's get it in," said Kornuth. They turned the cards over. Boudreau was ahead. The roar from the Kornuth rail could have burst a blogger's eardrum as Kornuth made trip eights. Boudreau fell away from the table into the consoling arms of his rail, while the Kornuth rail continued to cheer and Kornuth himself made a phone call. "Hi dad, I won," he told his father on the other end of the phone. "Bracelet, baby!" Chance Kornuth raised to 200,000, and Kevin Boudreau called. Both players checked the flop. The checked again after the turn. After the on the river, Boudreau checked, and Kornuth bet 300,000. Suddenly, the rails went silent. Boudreau then raised to 750,000. Chance counted out the call, checked his cards, put the bet back, and checked them again. "I call," he said. Boudreau announced he had a straight, showing for the nine-high straight. 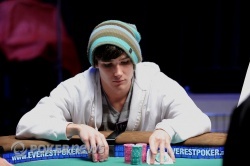 Kornuth paused a second before showing for the ten-high straight to scoop the huge pot. Kornuth is up to 4.15 million while Boudreau is down to 2.65 million. Danny Smith potted from the button and Kevin Boudreau put him in from the big blind. Boudreau walked away from the table. The rail attempted to close in on the table. The security lady asked them to step back from the table. "Just run it," the TD told the dealer. And with that, Danny Smith became our third place finisher. 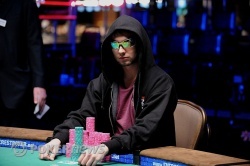 As usual, Kevin Boudreau and Chance Kornuth were heads up in a raised pot. The flop came out , and Kornuth checked. Boudreau bet 225,000, and Chance called. Both players checked the turn. The river brought the , and Kornuth bet out 115,000. Boudreau called the small bet. "You good," said Chance, mucking even before Boudreau showed for two pair.